Over 100 parents attended Yeled V’Yalda Early Childhood Center’s Health Care Institute, a program aimed at empowering Head Start parents to make better decisions about their children’s health care needs. The Health Care Institute is a national effort sponsored by UCLA and Johnson & Johnson and being offered at 30 Head Start programs around the country. The three-hour training took place at Sara Schenirer School at 4622 14th Avenue in Borough Park. Dr. Garey Ellis, YVY Director of Health Care Initiatives, Janie Friedman, RN, Health Coordinator in Brooklyn and Director of YVY’s Expectant Moms Program, and Svetlana Tenenbaum, MPH, WIC Nutritionist, led the training. Participants enjoyed complementary refreshments as well as lunch, in addition to free babysitting on site. They also received Gloria Meyer’s child health reference guide What To Do When Your Child Gets Sick, a book written specifically for the training. The book offers information on more than 50 common childhood medical issues and illnesses, and covers important topics like taking care of a sick child, what to do when your child gets hurt, and when to call the doctor. Yeled V’Yalda’s Health Care Institute was launched on October 28 in Staten Island, where over 100 parents participated in the training offered at Silver Lake Head Start at 10 Gregg Place. UCLA Head Start Research Director Dr. Ariella Herman traveled especially to Staten Island to help teach the program. Dr. Herman and her team will continue to assist Yeled V’Yalda with the 3-year effort, which will be offered at various YVY locations throughout Brooklyn and Staten Island. The next training is scheduled to take place in Canarsie. Yeled V’Yalda is the largest provider of Head Start and Early Head Start in Brooklyn and Staten Island and one of the largest in New York City, serving over 2700 children at 25 sites. Seventy percent of children in YVY’s programs are enrolled in Medicaid, Medicaid Managed Care or SCHIP. 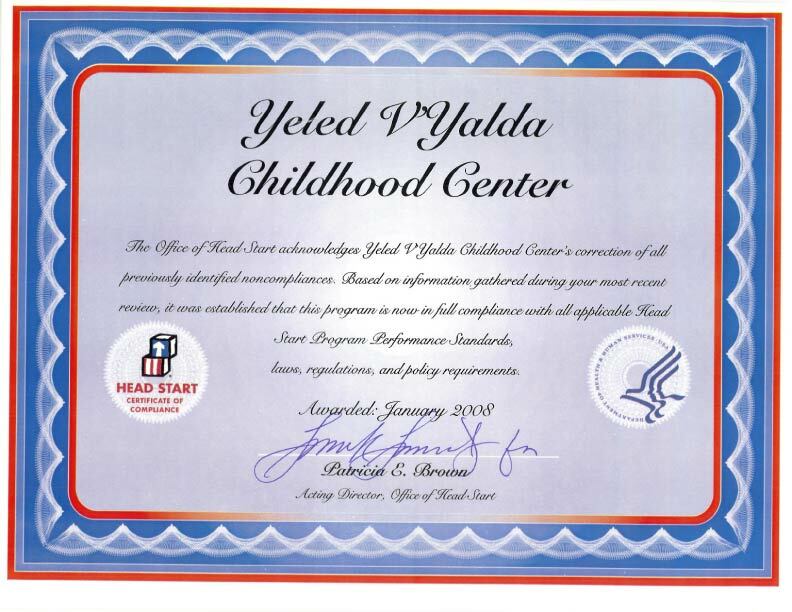 In addition to Head Start, Yeled V’Yalda provides comprehensive services to children and their families that include Early Intervention, Special Education, WIC (nutrition) and other health services. Yeled V’Yalda is one of the few Head Start centers that operates a WIC program on-site and has recently unveiled its new Mobile Dental Unit that will travel to each of the agency’s Head Start sites. The Health Care Institute is the latest project in Yeled V’Yalda’s efforts to provide for the health care needs of its Head Start families. The Health Care Institute is the result of a successful pilot training program conducted in 2001 that showed significant benefits to participating families as well as reductions in health care costs. Specific benefits included increased parental awareness of health warning signs; quicker response to early signs of illness before medical problems became serious; less emergency room and clinic visits; and lower health care costs for families. Parents reported a 37% drop in unnecessary visits to health care providers and a 48% decrease in emergency room visits in the six months following the training. This also translated into a dramatic 43% drop in the number of days parents lost at work and a 41% decrease in the number of days children were absent from school. The Institute’s goal is to train approximately 12,000 families nationwide by the end of 2005, with savings to Medicaid of approximately $2.4 million annually.